Ryukyu Life: Sunday's Silly Sign (Photo) Jul 17, 2011 Smokers Doggonit ! Sunday's Silly Sign (Photo) Jul 17, 2011 Smokers Doggonit ! Must continue until we get everyone properly trained. 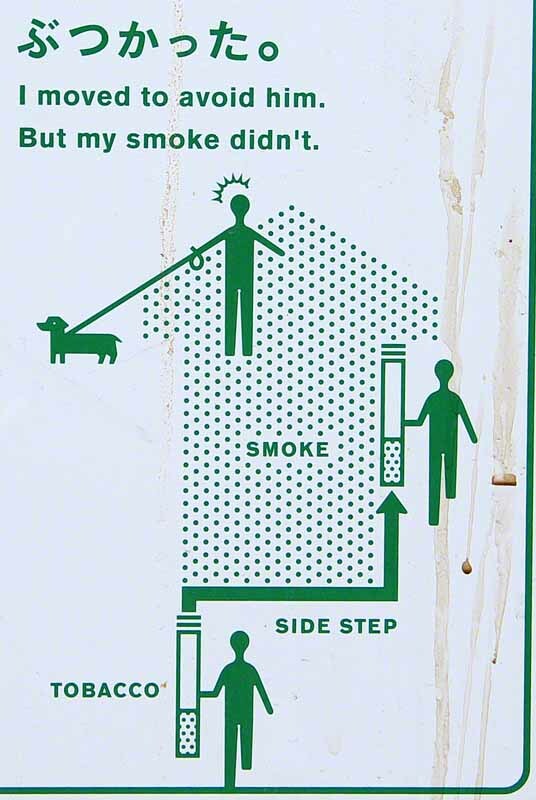 Doggonit, there's etiquette we have to teach smokers. First, we ought to cut down on the size of the cigarettes. It could qualify as a bazooka ! Etiquette? Well, if he'd side step a little further when he sees someone downwind of him, the smoke wouldn't have got the guy. The dog came out clean. Hah! This Sunday's Silly Sign was spotted at a convenience store in Okinawa, Japan. It was posted on the ashtray outside the front door of the place. That's where I go to buy my smokes and iced coffee. Somebody with no Slurpy Etiquette spilt a drink on the sign ! This is hilarious! I need to find that dog in the sign. He is one smart dog. Prb'ly a Doggonit Academy Grad. Now, if we could only get those Slurpy drinkers educated! Mike these signs you find are priceless mate. LOL. I may have uncovered them all on this island and will have to stsrt rowing my way off to others !